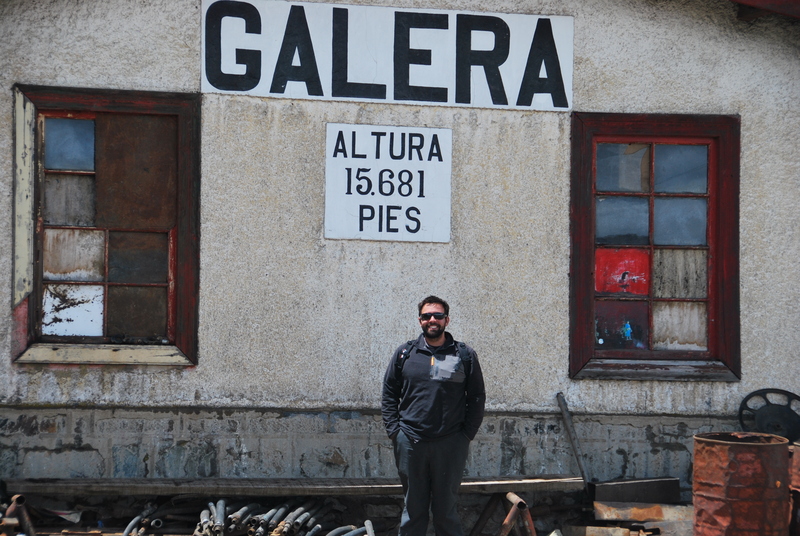 We knew the bus to Huancayo would be long. Twelve hours to be exact (and that’s if everything went smoothly). As it was supposed to be a scenic ride, we even opted to take the cheaper daytime bus. Just judging by the fairly dilapidated look of the bus, we instantly knew this was going to be a rough and interesting ride. -Driving on a bridge with seriously two inches of clearance on each side. I am still amazed we made it through without hitting anything. You could literally touch the bridge from the bus... scary! -Driving on rough and bumpy dirt roads. We’ve actually gotten quite used to this. We weren’t really even fazed by the fact that this road had a sheer drop off on one side. However, this road did have a slight lean (towards the cliff, of course) that made taking those bumps a bit more interesting. -Learning that our bathroom break was a small ravine on the side of the road. Kristen bonded with a few nice Peruvian ladies over that one. -No TV with bad movies to distract us. The TV looked like it was last functional before we were born. -Staring at the gorgeous mountain vistas. 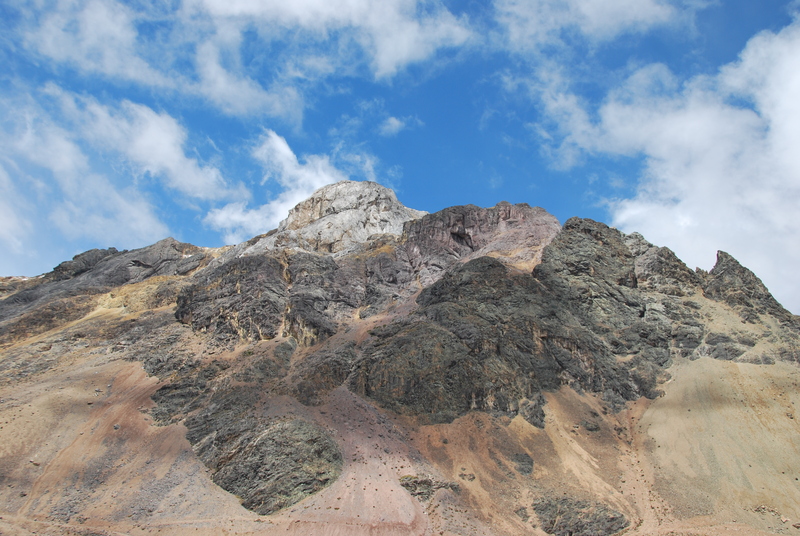 I think by now we must have seen every mountain in Peru. -The extra long bus “infomercial.” Often times people board the bus and do a little presentation. Billy Mays would have been proud of this guy- he “presented” for a half hour! The people were receptive though, and he sold quite a bit. His spoke slowly and clearly so it gave Kristen a chance to practice hearing and understanding Spanish. Despite understanding 85% of his message, we didn’t buy any of his vitamin supplements, even though he offered to double the order for free. Luckily the ride passed relatively quickly and we made it safe and sound to our destination. 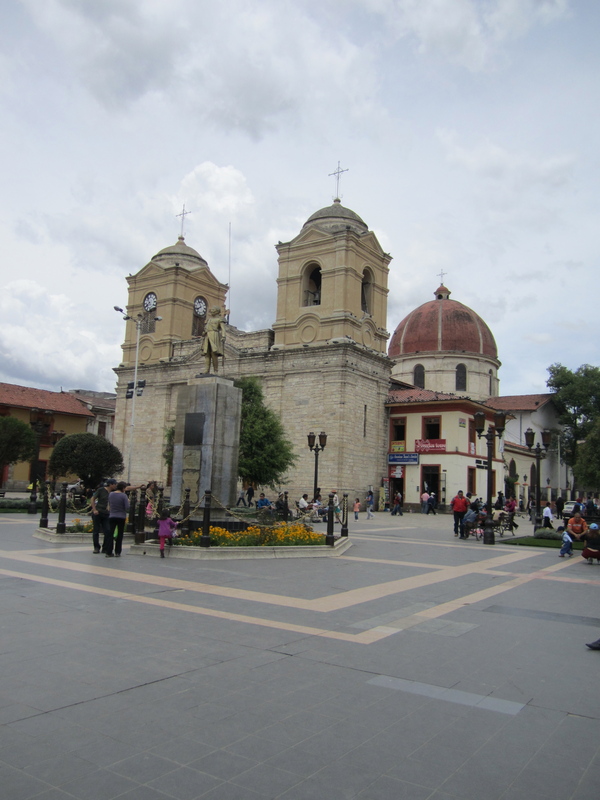 Huancayo was a much larger city than Ayacucho, but it still had its charms. The main square was always full of people, and it was fun to watch the action unfold. We are horribly ashamed to admit this, but on our first evening in Huancayo, we caved at the sight of Burger King. We think it was the fact that it was the first yellow cheese we’ve seen in three months, and honestly, it was a pretty decent burger and fries. Don’t worry though, we ate plenty of other local food to make up for supporting the King. 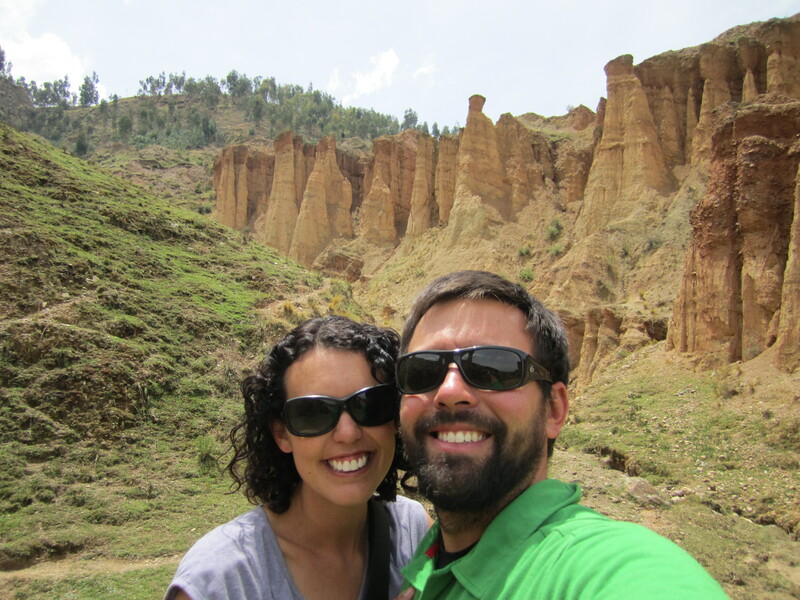 Since we only had one full day in Huancayo, but we tried to make the most of it. 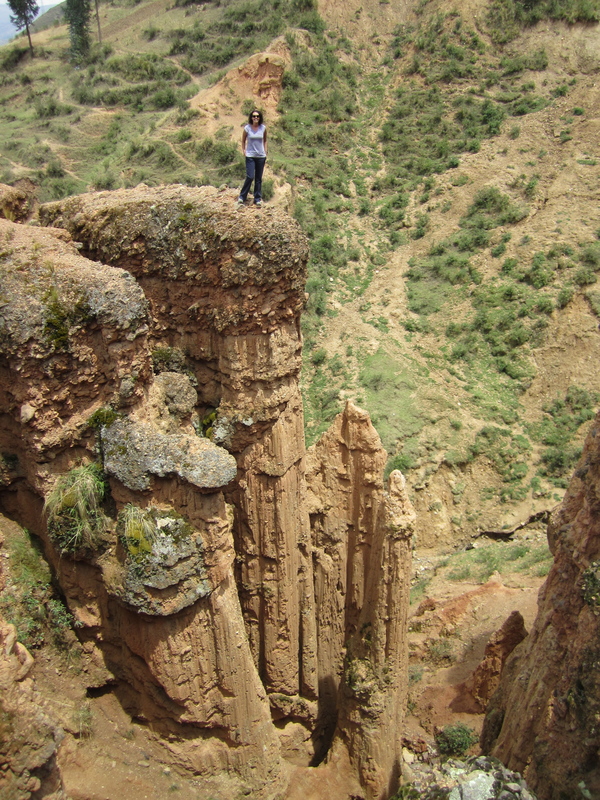 First, we hiked up to “Torre Torre,” a strange-looking group of “towers” made after years of erosion. We enjoyed hiking around them and seeing what crazy pictures we could take. 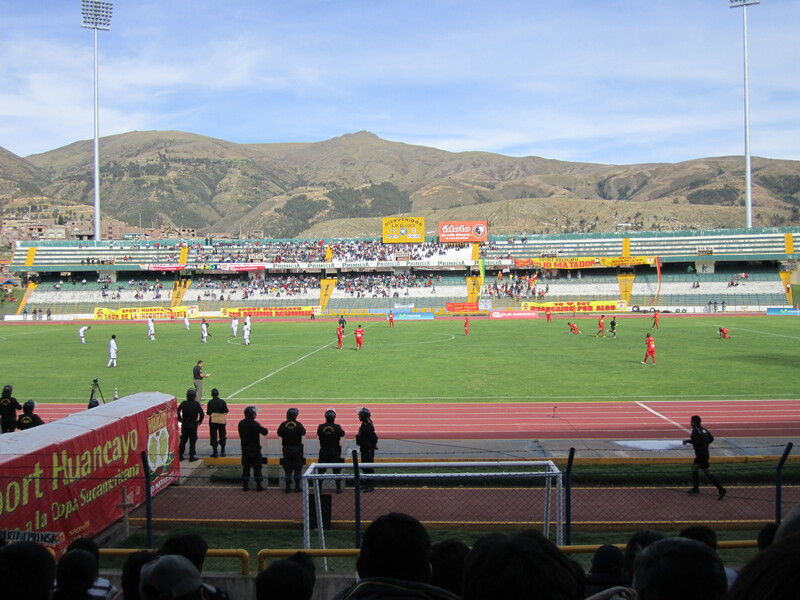 Later that afternoon, the highlight of the day was attending our first futbol game in South America! We were accompanied by our hostel owner’s son, who was very excited about the game. 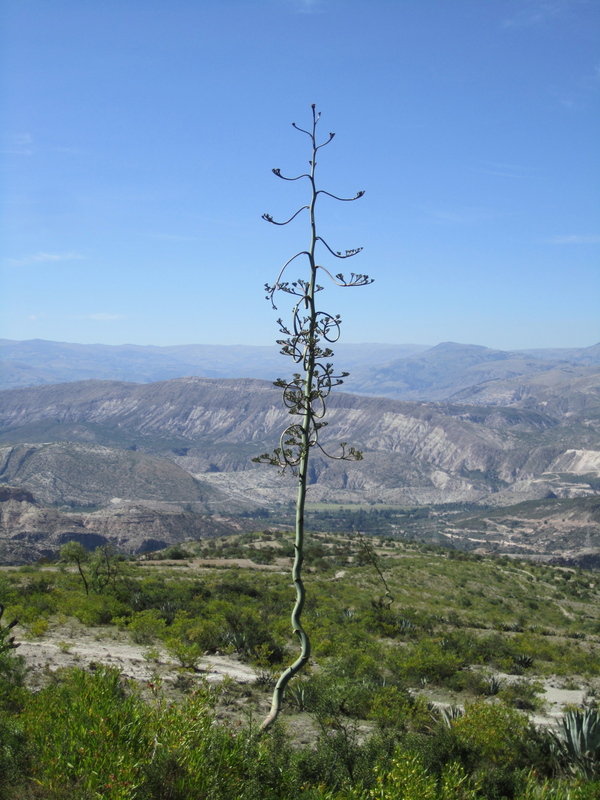 We were able to chat in basic Spanish, and he even tested out some of his English with us. He was a great sport and answered all of our questions. The crowd wasn’t as big or rowdy as we were expecting. 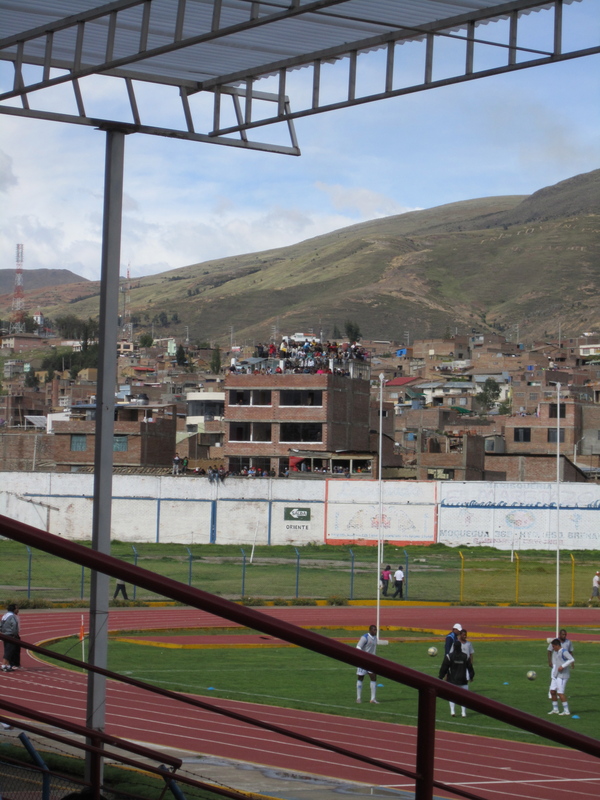 There were, however, quite a few houses around the stadium with huge groups on their roofs. Not sure how safe that is. The game was entertaining to watch, but in all honesty, it wasn’t the most exciting game ever. 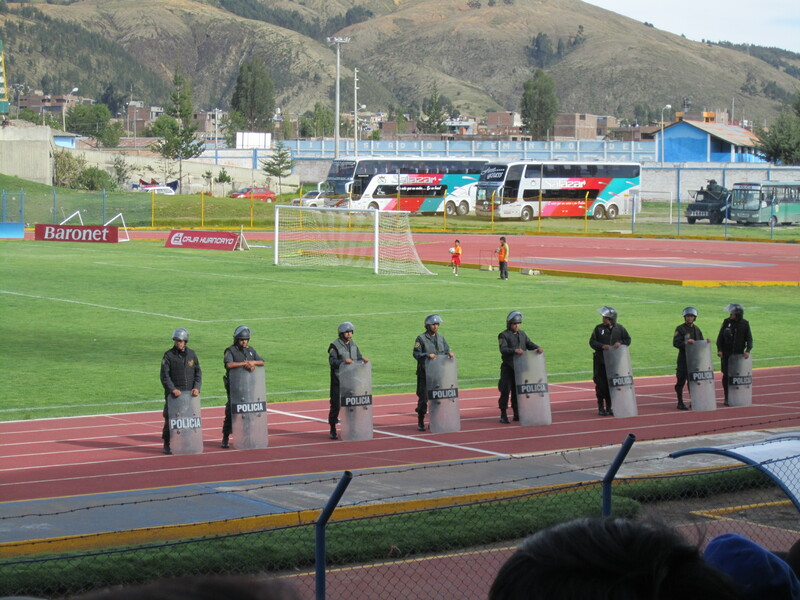 Huancayo won 3-0, and the crowd was pretty tranquilo, so there wasn’t a need for all the extra police after all. The next morning we awoke bright and early at 5 am to catch the train to Lima. 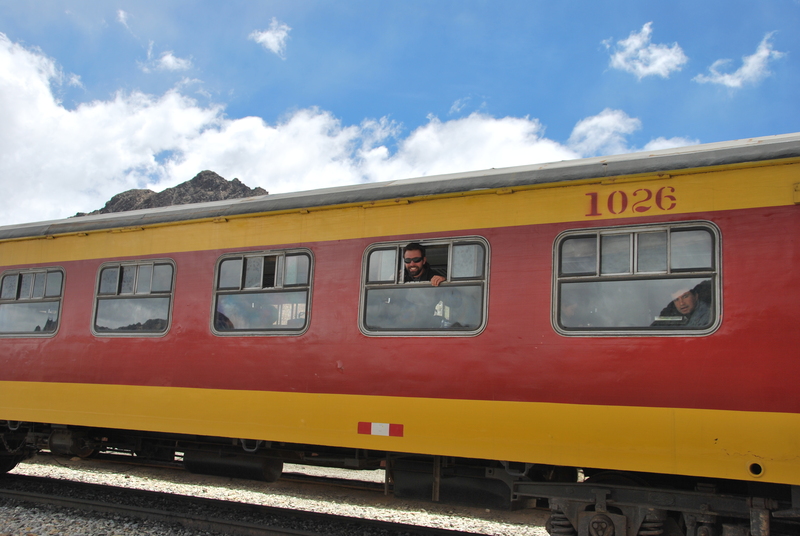 This train is definitely the longer way to get to Lima (12 hours vs. 8 hours on a bus), but is scenic and the second highest in the world. 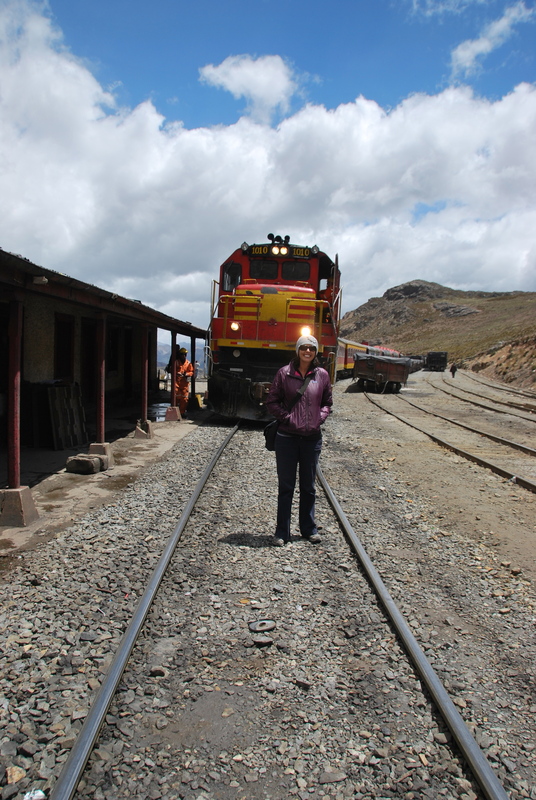 We were lucky to be able to catch this train because it only runs about twice per month and we actually took the last train of the season (the train can’t run during the wet season). 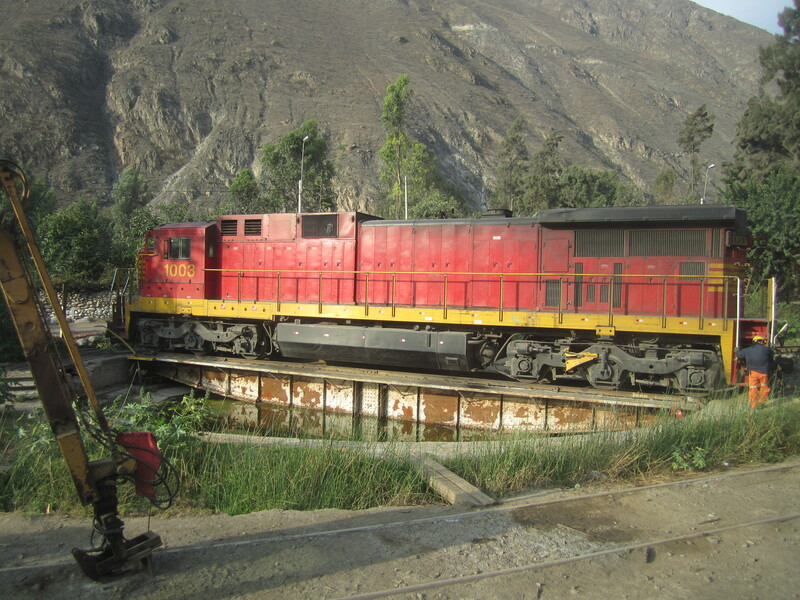 The train left the station on time, shocking for Peru, and we headed out of town. You could tell that the train does not run to often because all the locals came out of their houses to wave and watch the train roll by. We were lucky not to have anyone sitting across from us, so we were able to spread out and relax. 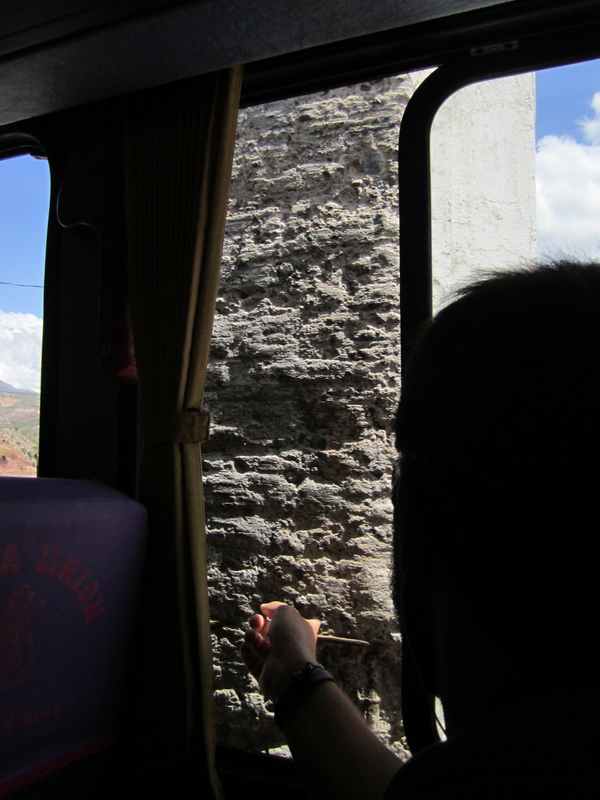 We quickly left the city and started climbing into the Andes. 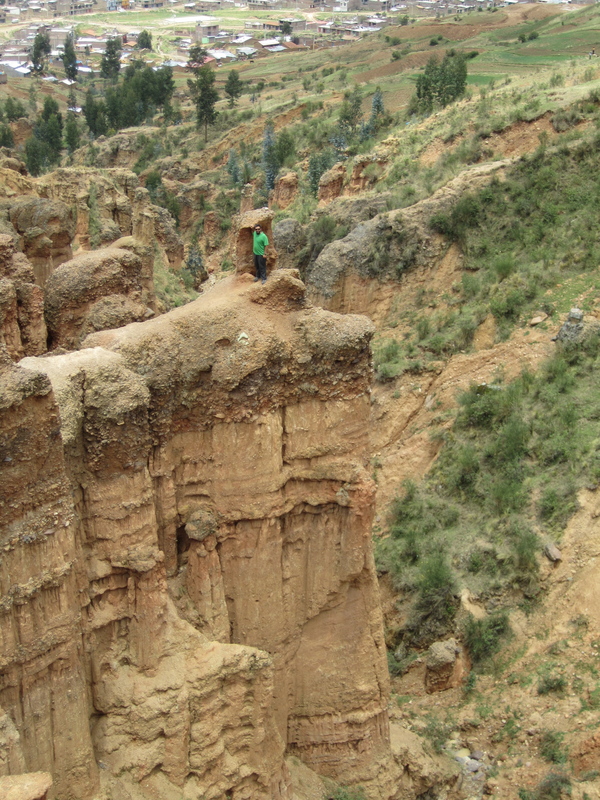 We followed the river which carved its way through a canyon while climbing the hills. The scenery and views continued to get better and better as we went. 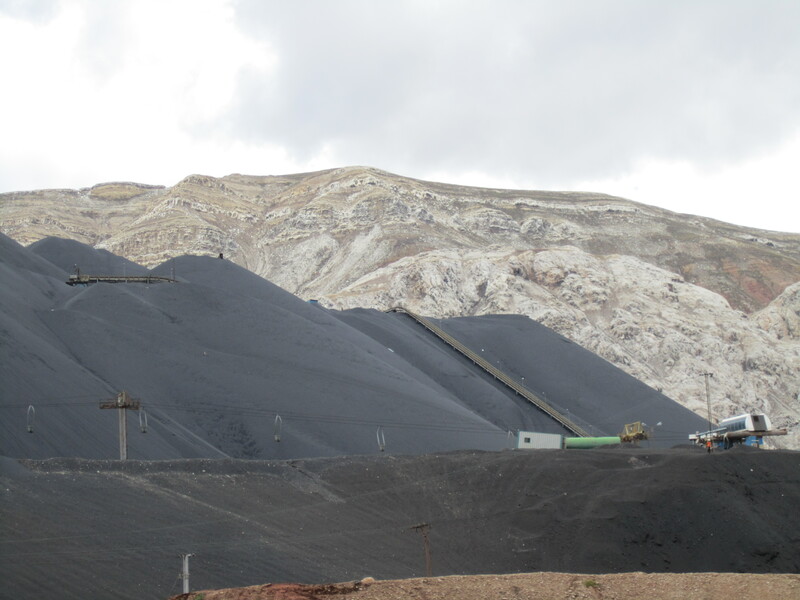 We passed a few different mining operations along the way, which generally aren’t so scenic, but we were surprised to see how they transport the coal. 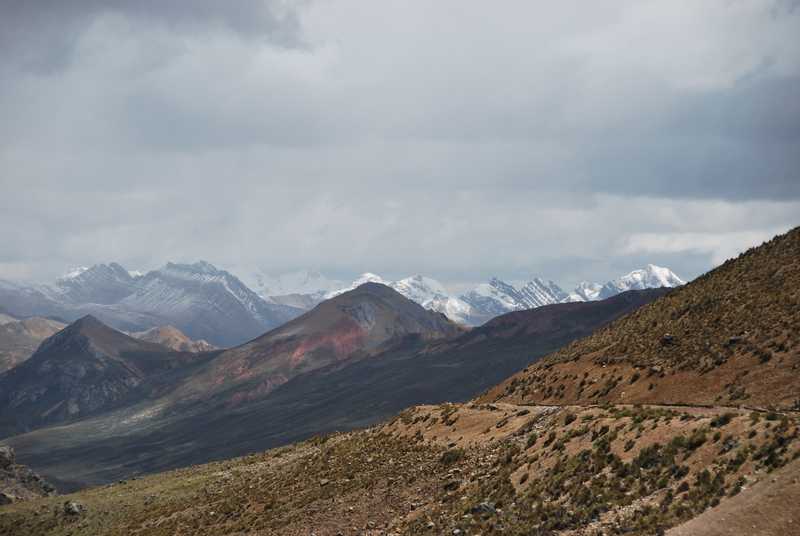 As we climbed, the mountains became more beautiful and it got significantly colder. At one point it barely started to snow and the locals were sticking their heads out the window trying to catch a microscopic flake or two. Guess they don’t see the white stuff too often. 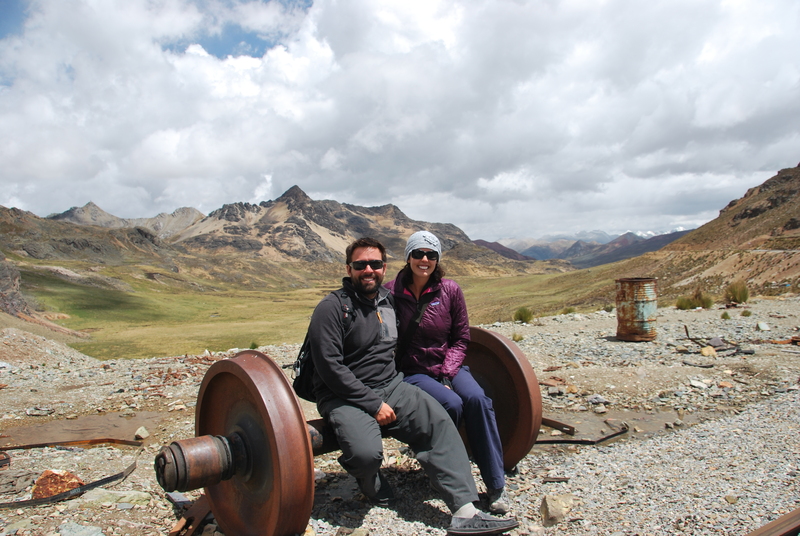 When we reached the highest point at 15,681 feet, the trains stopped and we were able to get out for a bit and take some pictures. We arrived in Lima a bit shaky after being jostled around for a little over 12 hours. 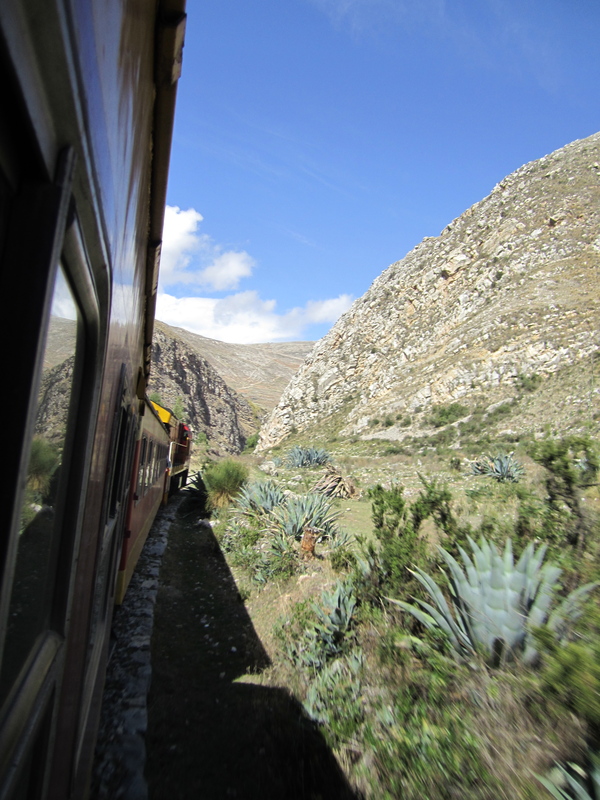 This wasn’t the smoothest train ride we’d ever taken, but it was one of the more interesting ones. Off to eat our way through Lima’s many delicious restaurants. I can safely say that this has been Trevor’s favorite entry to date…and the Galapagos set the bar pretty high. He loved the pictures of the trains, especially the one on the turn around. My guess is that you thought of him a few times while aboard the train! Love you guys…will send a full email later.